Morrigan is a cursed child, so everything bad that happens is blamed on her. That doesn't matter, though, because she will die on her twelfth birthday and everyone will be rid of her, including the family that only grudgingly acknowledges her existence. 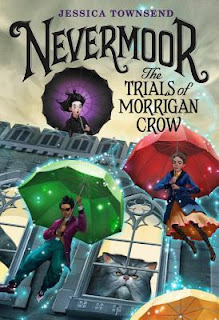 However, on Morrigan's 11th birthday, two unexpected things happen: death comes for her and she is rescued by a strange man from Nevermoor and invited to join the trials for entrance to the Wundrous Society. Morrigan revels in this new world where she isn't thought of as cursed and where strange, magical things occur every day, but what will happen if she doesn't pass the trials? This is an excellent fantasy story a la Harry Potter, and one that I will easily and readily recommend to the middle grade readers in my library. My only quibble is that it is just the first book in the series and the rest haven't been written yet, so I can't read the second one at the moment. Liam and Phoebe are Martian children; that is, they are humans who have been raised in the Mars colony. 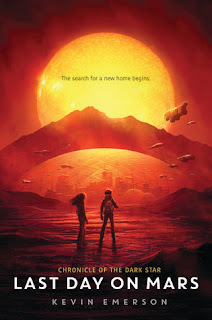 Earth is no more, and the sun will soon go supernova, so the Martian colony is being emptied of its inhabitants as they head for a distant star and the hopes of another planet. 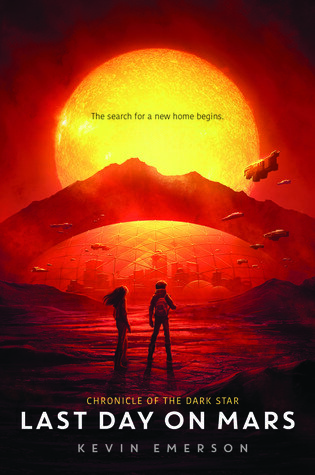 The children of scientists, Liam and Phoebe are among the last to leave the planet. But then they discover a deeper plot behind the destruction of their home world. I enjoyed the idea of a Martian colony, of the kids sneaking around and getting in trouble like kids do, and of the various catastrophes that befell the duo as they attempted to save their parents and get to the colony ship before it left orbit. The big, hidden, twist in the plot that made things complicated at the end, however, seemed a bit much for a kids' book. In an adult novel, there would have been more room to address this twist; in this kids' book, it seemed like a bit of a stretch. Red Flags: "fantasy violence" - people nearly dying, etc. My science storytimes have been much more successful than the separate science club program I attempted to do. 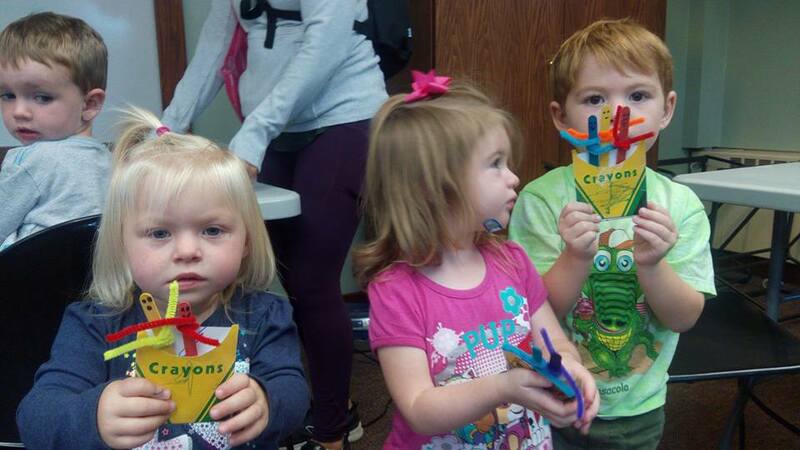 Here's what we did for worm storytime. Instead of a craft, we made worm habitats. Googling "DIY worm habitat" will yield plenty of ideas, but I gave each family an empty 2-liter bottle which had had its top cut off, a 20 oz water bottle to sit in its center, and a bunch of sand and soil to spread in layers in their bottles. Once the sand and soil are in the layers, the kids were able to choose their worms. Next, while the worms were settling in, we made "curtains" for the outside of the habitat. Worms don't like sunlight, so they need a barrier around the bottle. I cut black construction paper so it would fit around the bottle and let the kids decorate it with chalk, then we taped it into a "sleeve" that would slide on and off the bottle with ease. 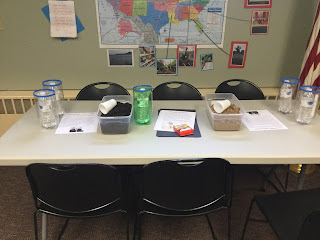 I sent home directions for caring for the worms along with suggestions for ways to "free" the worms when the families were done with them. This program was a huge mess and took much longer to clean up than a standard storytime, but it was definitely worth it. I do science-related storytimes once a quarter, and this one definitely got the best response so far. I have had parents and kids coming up to me and giving me updates on their worms throughout the week. Jazz lives in Artemis, the only city on the moon. She's a courier and a smuggler, and ends up involved in a complicated plot to take over the city's oxygen business. If you are looking for another Martian story, this isn't it. If you're looking for a story similar to The Martian, this isn't it. What this is is a mystery-thriller type story that happens to take place on the moon, so there are complications one wouldn't expect on Earth. 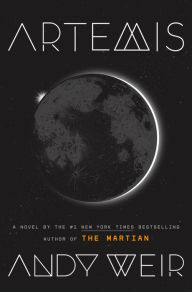 Weir's "voice" is very clear in this book and I enjoyed it, but it is not, I repeat, another Martian story. 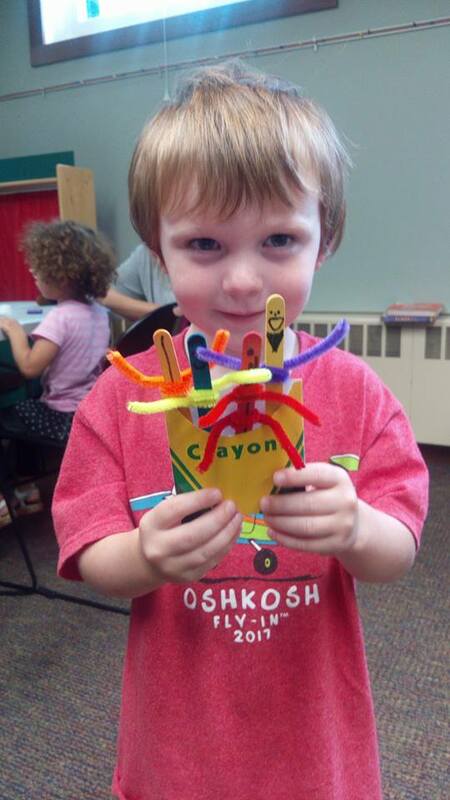 I did a storytime about crayons for my "back to school" storytime this year. Our craft involved making "crayons" out of colored craft sticks and pipe cleaners, so these crayons could be used by the children to reenact the stories about anthropomorphic crayons that we read. Gordy comes from a family of potion masters, and he is in training to brew potions himself. His parents are impressed at his abilities to make excellent potions. While his mother is away on potion-brewing business, Gordy receives a package addressed to his mom and opens it. Soon after, mysterious people come to his house and attempt to steal the package. 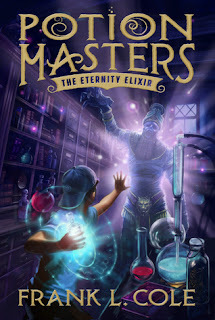 Thus begins a race between Gordy and his family and the villians who want what Gordy has received - the eternity elixir. This book is an action-packed fantasy adventure perfect for fans of J.K. Rowling and Holly Black. The story reads similarly to the final chapters of the first Harry Potter novel: there isn't much world-building, but plenty of action and problem-solving. Fans of fantasy will enjoy the potion-making world and will be eager to read the next one. Recommended. My library was already using 1KBB4K when I started here, but I quickly realized that this was a very underutilized program. It is listed on my monthly statistics, but I can count on one hand the number of times in the past year that someone has asked about it or turned in a reading log, etc. etc. If we're going to do a program, I want us to actually have some involvement, so I decided it was time to relaunch 1KBB4K at my library. 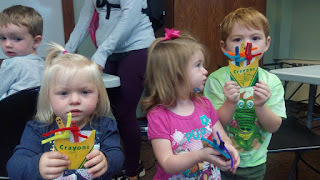 I planned my relaunch for late September, after the school-aged kids were settled in at school and storytime had returned to its non-summer routine. I planned to do this relaunch twice: once during our regularly scheduled morning storytime and once as a special evening event for families who cannot attend our daytime programs. As part of this relaunch I decided that our materials needed to be gone through as well. Previously our library had used colorful reading logs where each color corresponded to a particular level in the program. We also had a small bin of prizes - mostly temporary tattoos - and no signage or displays relating to this program. I created a racetrack display in our meeting room. If a racetrack doesn't suit your fancy, there are dozens of different 1KBB4K display pictures available on the internet. The important thing was to have something up on the wall that the kids could see. For me, this has a double benefit: the display is up so kids can keep track of their progress, and this display happens to be in the same room where we have storytime every week, so kids and caregivers will see this display and be reminded about the program. I admit I was disappointed to discover that we only had temporary tattoos as prizes to give to 0-5 year olds. Many of the kids participating in this program are too young to want or enjoy a temporary tattoo. I understand that the idea is to give them a fun prize they will enjoy, but that won't break the library's budget, but I was able to replace those tattoos with some prizes from the party aisle of my local big box store. I found a variety of things - small sports balls, bracelets, little containers of Play-Dough, etc. I made sure to include items that are good for very young children and are not choking hazards. A box of colorful toys is much more fun to dig through than a box of temporary tattoos. This is not from my library, but these are what our log sheets looked like. Our old reading logs required parents to write out the title of every individual book they read with their children. This means in addition to reading 1,000 books, they had to write 1,000 titles, and all of this on top of what is probably already a very busy schedule. Since I don't actually need to know what books a child has read, I made a new form that consists of 100 flags, and the kids and their caregivers can color in or cross out a flag every time they read a book. Not only does this eliminate the title-writing requirement, but it also allows the child to participate in marking their books on the sheet, which will help build enthusiasm for the program. Our new reading logs also leave a space to write in what number the patrons are working on (0-100, 101-200, etc. ), so we can use the exact same log paper for every patron and there is no need for storing multiple copies of multiple sheets. When I can make things easier for the patrons and easier for my staff, everyone wins. I ran the kickoff program itself much like I would a standard storytime. 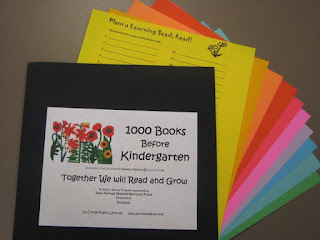 I read books, sang songs, and recited rhymes with the kids, and in between activities I told the parents about various benefits of reading 1,000 books with their child. At the end of the storytime, I had a craft set out for the kids and a table where parents could sign up for the program. Patrons who signed up received a bag with some small goodies (pencil, bookmark, etc.) as well as information about the program and a list of suggested books to read. Each child attendee was given a raffle ticket as I was able to give away some of the Kohl's Cares plushies and book sets (which our library received as a donation). Time will tell if this does indeed respark the interest in this particular program. Does your library use 1,000 Books before Kindergarten? Do you do a different, similar program? Let us know in the comments! Amy Anne is a true bibliophile; she has even told her parents that she's part of various after school clubs so that she can stay longer at the school library and read. 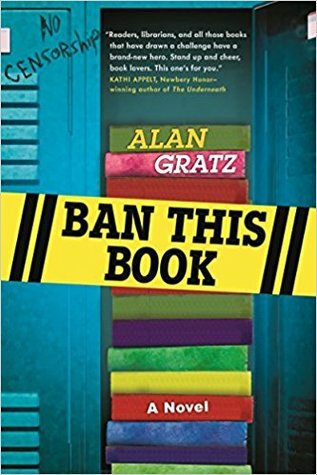 One day she discovers that her favorite book has been removed from the shelf because a parent thinks it is not appropriate for an elementary school. Before she knows it, dozens more books are being removed, and the librarian is powerless to stop it. 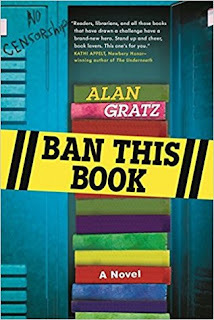 Amy Anne gets her hands on as many of these books as possible and starts a library in her locker, but like most secrets, this one doesn't stay hidden for long. As a librarian, I obviously have a vested interest in the freedom of information. I love that I have books on my shelves for all kinds of people. I enjoyed Amy Anne's story like I enjoyed Escape from Mr. Lemoncello's Library - the literary references were fantastic. The story itself is a fairly standard "middle grade girl develops backbone, talks about her problems, and gets them solved" story a la the afterschool specials I used to watch. And it's just as preachy as an afterschool special, which caused me to roll my eyes a few times. But it's a cute story nonetheless, and I think it would appeal to those kids who have read every single book on the shelf twice and are eagerly awaiting something new.